Group Therapy plays jazz standards of the 30'w, 40's, and 50's , and some of the more contemporary favorites. Special arrangements and original works by Bob Boyers are also featured. Jim Douglas contributes vocals of fine style and versatility. Group Therapy has become a Quintet and has two new players to augment their excellent Jazz repertoire. Well known to the Northwest, saxophonist Sean Flannery, on Tenor, and Eugene's own, Glenn Griffith on Trombone. From time to time we will be joined by saxophonist Jesse Cloninger on Alto. These accomplished musicians also play with other regional groups such as: Swing Shift and the Red Oak Station Blues Band. 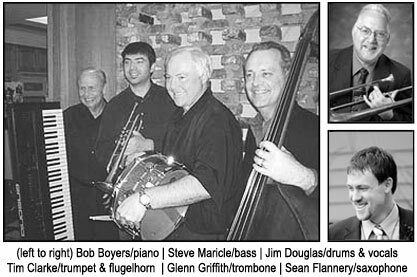 Bob Boyers often plays as a Solo for dinner music or 'Cocktail piano' at special events. Tim Clarke is active with several groups including the Emerald City Jazz Kings. Steve Maricle, bassist, also plays trumpet and cornet. Tim Clarke has taken his musical creativity to New York State, and is living in the town of Aurora, near Buffalo, N.Y. He will be available for some music events in that area as much as his 'day job' will permit. We miss him, and it will be hard to find the right person to fill that spot. GROUP THERAPY --In Session is now on sale through the CDBaby or the contact info listed below and where ever the 'group' is booked to play. For mail order the price is $12.00, plus cost of handling, usually $3.00. This CD is a nice mix of mellow and upbeat tunes including some swinging originals from Bob Boyers. Also, a couple of fine vocals by Jim Douglas. Feel free to call or write an email to the address or phone listed below for your copy. Private parties are always possible so call or write if you have something on your calendar that needs live entertainment. Contact Linda Boyers in Eugene.